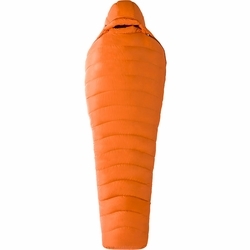 Marmot Lithium 0 Sleeping Bag. Tally up the ultra light fabric, high quality down and a minimalist design, and the Lithium stacks up to be Marmot's lightest bag for mountaineers and backpackers. Good in conditions down to zero degrees Fahrenheit, the updated design features on this bag help reduce shifting down and increase ventilation.